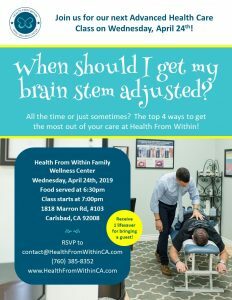 When should I get my brain stem adjusted? All the time or just sometimes? The top 4 ways to get the most out of your care at Health From Within! Description: Join us for our next Advanced Health Care Class! April’s topic is “When should I get my brain stem adjusted? All the time or just sometimes? The top 4 ways to get the most out of your care at Health From Within!”. Arrive at 6:30pm for lite bites and mingling. Receive one lifesaver for bringing a guest!